Amitabh Bachchan is an Indian film actor. He first gained popularity in the early 1970s as the angry young man of Hindi cinema, and has since appeared in over 180 Indian films in a career spanning more than four decades. 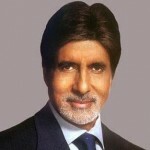 Bachchan is regarded as one of the greatest and most influential actors in the history of Indian cinema. Bachchan has won numerous major awards in his career, including three National Film Awards as Best Actor a record he shares with Kamal Hassan and Mammootty and fourteen Filmfare Awards. He is the most-nominated performer in any major acting category at Filmfare, with 37 nominations overall. In addition to acting, Bachchan has worked as a playback singer, film producer and television presenter. He also had a stint in politics in the 1980s. He has received both the Padma Shri and the Padma Bhushan civilian awards from the Indian government. On 27 July 2012, Bachchan was given the due honor to carry the Olympic torch during the last leg of its relay in in London's Southwark.